The political candidates have done a great job in making their names household brands in a relatively short span of time. I would venture to guess that even young grade school children know and have watched Hilary Clinton, Bernie Sanders, Donald Trump, Marco Rubio, and Ted Cruz on social media videos. The 2016 Presidential Race has garnered more media attention as colorful candidates and a firestorm of competitive debate has given Americans something we love – entertainment. However, the stakes are high. In past campaign years, many blame the media for unfairly portraying candidates in an effort to help persuade voters to their endorsed political party. While the news media has always had the power to influence and persuade voters towards or away from any political candidate, the onus has shifted. 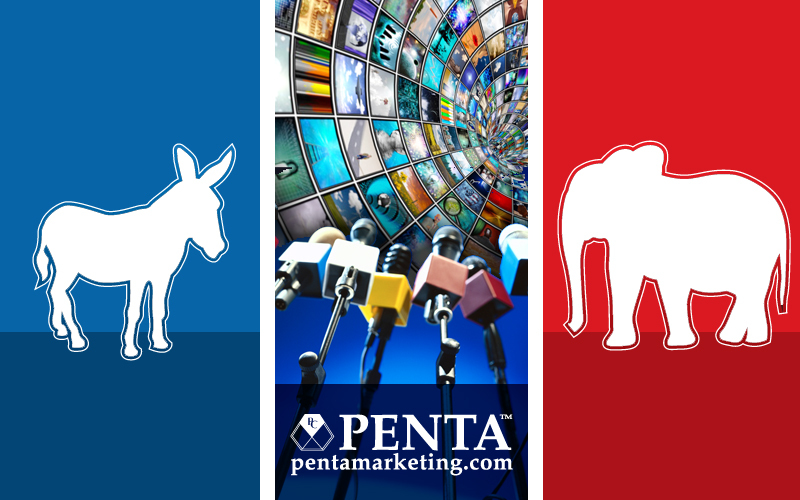 The 2016 election year has the potential of exhibiting the most strategic political media campaigns of our time with the opportunity for candidates to control perception with their messaging through the power of social media. It’s no surprise that digital has emerged second to only TV in terms of advertising expenditures, however even with media spending in the digital space, savvy political marketers must remember to effectively and strategically use the power of social media to drive strong messaging, news content, and feedback on the news media’s portrayal of them with millions of voters. Many voters, most especially millennials, have shifted their social media preferences to video. This year, more video than ever have emerged online from selected debates, rallies, Town Hall meeting replays, and general campaign trail footage. According to CIO Magazine, in 2014, 16% of the registered voters followed candidates on social media. This number has only increased over the past two years. We are seeing how the media is leveraging this fact with consistent video posts by major news networks including CNN, ABC, and others as they flood their daily social media feeds with videos for viewers who are part of a growing trend, wanting to watch instead of read. This year, the political ad spend for the presidential race is expected to exceed $10 billion with social media spending reaching more than half a billion dollars. With social media providing candidates with the ability to control their messaging in terms of how often they distribute their posts, tweets, videos, etc., and with an unprecedented opportunity to strategically write content that has the potential of leveraging and powerfully persuading the American public to understand their values, to become more engaged and knowledgeable, and most importantly, better equipped to make a voting decision, we have to ask whether our candidates are truly using the full power of a strategic social media campaign to fully maximize its value and potential impact on voters. Over the years, extensive studies have indicated the importance of social media in elections. One of which published by Facebook in 2012 shows the significant impact Facebook has on voting patterns. According to a recent study released by Pew Research in October 2015, 65% of all adults in the USA are using social media networking sites. If we look at our current Presidential candidates as they race to see who will be the GOP and Democratic front runners after today’s Super Tuesday results are tallied, perhaps we can see if there are any correlations to their effective use of social media to influence their fate.